Rev. George G. Harris, CSV, died on Thursday, October 31, 2002 at the age of 65. He was born on January 17, 1937 in Decatur, Indiana to the late George W. Harris and Mary Louise (Pond) Harris. He is survived by one sister, Marilyn Ponce of Las Vegas, Nevada, and four brothers, Matthew L. Harris of Accokeek, Maryland, Michael O. Harris of Mesquite, Nevada, David Harris of Kankakee, Illinois and Father Daniel Harris, C.M., of Camarillo, California. Fr. 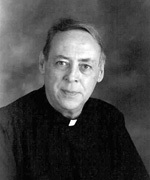 Harris professed First Vows as a Viatorian on September 8, 1955, Final Vows on September 8, 1958 and was ordained by Bishop O’Donnell on June 8, 1963 in Chicago, Illinois. He was a graduate of St. Patrick High School in Kankakee, Illinois and Loyola University, Chicago, Illinois, where he received his B.A. in History. He completed graduate studies at Loyola University, Chicago, where he received his M.A. in English History, at Catholic University of America, where he received his M.A. in Education (Administration) and postgraduate studies at Notre Dame University, South Bend, Indiana. During his ministry, Fr. Harris served his pastoral year at St. Viator High School in Arlington Heights, Illinois in 1963, as teacher at Griffin High School in Springfield, Illinois from 1964-68, as teacher and principal at Bishop Gorman High School in Las Vegas, Nevada from 1968-80, as Assistant Principal and Dean of Students at Griffin High School in Springfield, Illinois from 1980-87 and as teacher at St. Viator High School, Arlington Heights, Illinois from 1987 until his death. 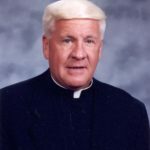 Visitation was held at St. Viator High School Chapel in Arlington Heights, IL on Sunday, November 3, 2002 from 4:30 to 8:00 p.m. A Mass of Resurrection was celebrated on Monday, November 4 at 10:00 a.m. at St. James Church in Arlington Heights, IL, followed by a luncheon at St. Viator High School. Burial was at Queen of Heaven Cemetery in Hillside, IL. Please remember Fr. Harris and his family in your masses and prayers.